Description: New, high-risk technologies, ranging from the very small (synthetic biology, nanotechnology) to the very large (geoengineering), are being rapidly developed. Promoters promise solutions, but the precautionary principle and social and economic impacts are often ignored in the rush to deploy the latest technofix. Without the strict application of the precautionary principle, and a transparent and real participatory way to assess impacts, these new technologies could wreak more havoc on our already fragile planet, battered by reckless and unsustainable forms of production. 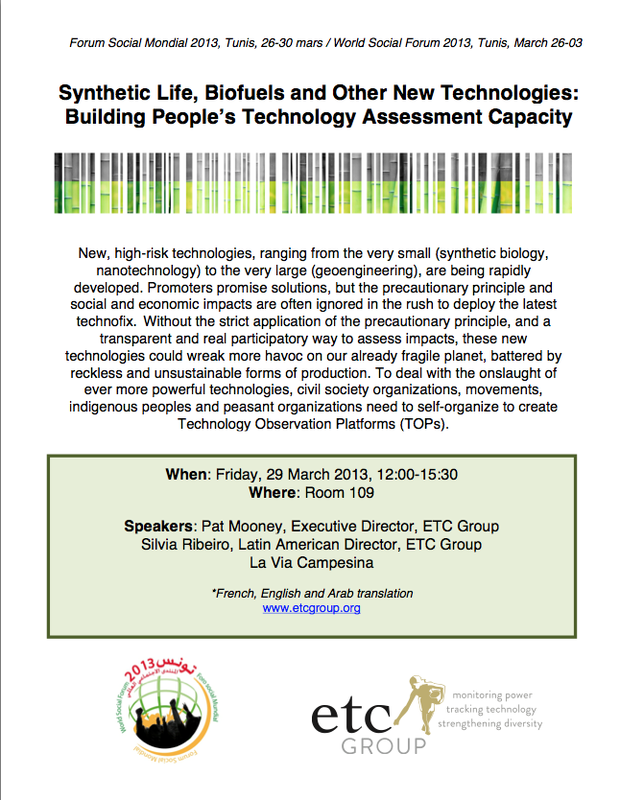 To deal with the onslaught of ever more powerful technologies, civil society organizations, movements, indigenous peoples and peasant organizations need to self-organize to create Technology Observation Platforms (TOPs).